I promised this post weeks ago so I’m sorry about the wait but I promise it’s worth it! This recipe is adapted from a Sainsburys mini muffin recipe, hence why (as you’ll see) I don’t have an exact cooking time for full sized ones. 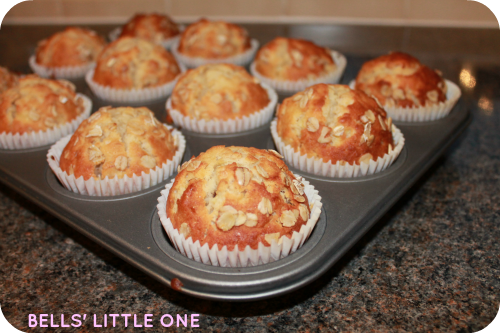 I personally think mini muffins are a waste of time as I have to eat about six (on a good day!) before my greedy self is happy. Anyway…. Preheat the oven to 180°C (Gas mark 4). Mix the eggs, sugar and sunflower oil together in a bowl. Fold in the flour and baking powder (I don’t know why they don’t use self raising but the recipe works just fine without… I don’t fix what isn’t broken!) and then the porridge oats. Finally mash up the banana and cut up the chocolate (I cut up each square into four pieces – any smaller and the chocolate just melts and disappears but any bigger, they sink to the bottom of the muffins) and add both the mixture. 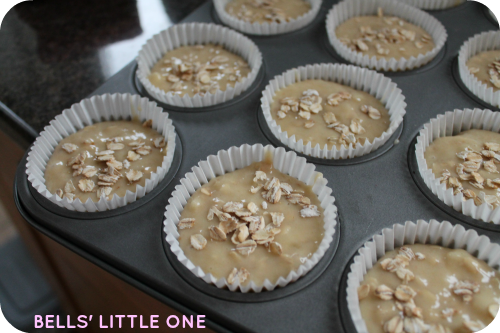 Spoon into muffin cases and sprinkle the tops with oats then bake in the oven until golden brown (I find it’s usually about 30 minutes). 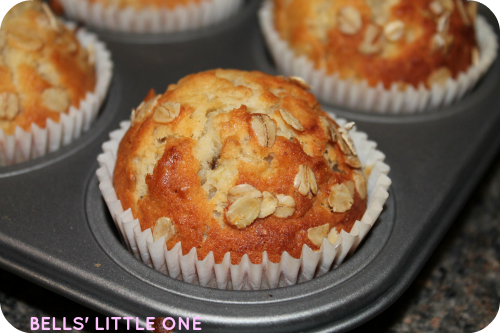 I love this recipe because you can change it to make just about any flavour of muffins you could think of. I’ve made apple and cinnamon (just by guessing roughly how many apples equalled two bananas, honestly it was that scientific!). I think I may try making peanut butter M&M ones next time….. mmmmm…..